Singing Plants Reconstruct Memory is an interactive installation in which living plants are keepers of story, cultural history and memory. The intent is to reconstruct what has been lost and repressed through trauma: the unspeakable. Each Banana Leaf plant bears scars and soul wounds at different stages of healing. These physical wounds are sutured together with conductive thread. When participants reach out to the plants, they sing Hudhud chants of the Ifugao people, play Philippine indigenous instruments, and tell a story of remembrance (click here to view "Paalaala/ Remembrance"). This project emerges from my personal experience of indirect witnessing. My great-grandparents lived in the Philippines when it was a Spanish colony, my grandparents experienced the shift to another colonial power during the Philippine-American War, my father grew up during the Japanese occupation of Manila, and my immediate family immigrated to Canada to escape Martial Law. These events have different resonating points for each generation. As a child, I learned to be a silent witness to these stories of our family’s roots of resistance. As I got older and started asking questions, I learned that adults have the prerogative to forget. 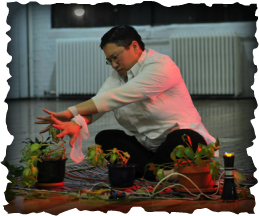 While Singing Plants Reconstruct Memory is based on a personal memory, my work is fundamentally connected to the social and political consequences of war and occupation in the Philippines. While doing research in the Philippines, I listened to our family stories unfold again. My Ninang (godmother) said she could hear the voices of our ancestors during those times, as those who reside in the spirit world are present when we include them in the telling. While these reconnections across time bring a deeper understanding of my family and homeland, they also bring a longing to make meaning from traumatic history. The goal of Singing Plants Reconstruct Memory is to bring the story into the room. The participant acts as an indirect witness - one who did not experience the trauma, but whose engagement makes it possible to reconstruct the fragments left behind.